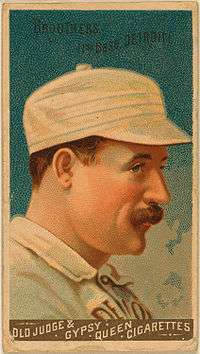 Dennis Joseph "Dan" Brouthers (/ˈbruːθərz/; May 8, 1858 – August 2, 1932) was an American first baseman in Major League Baseball whose career spanned the period from 1879 to 1896, with a brief return in 1904. Nicknamed "Big Dan" for his size, he was 6 feet 2 inches (1.88 m) and weighed 207 pounds (94 kg), which was large by 19th-century standards. Recognized as the first great slugger in baseball history, and among the greatest sluggers of his era, he held the record for career home runs from 1887 to 1889, with his final total of 106 tying for the fourth most of the 19th century. His career slugging percentage of .519 remained the Major League record for a player with at least 4,000 at bats until Ty Cobb edged ahead of him in 1922. At the time of his initial retirement, he also ranked second in career triples (205), and third in runs batted in (1,296) and hits. A dominant hitter during the prime of his career, he led (or was in the top of) the league in most offensive categories, including batting average, runs scored, runs batted in (RBI), on-base percentage and hits. He led the league in batting average five times, the most by a 19th-century player, and his career .342 batting average still ranks ninth all-time. Brouthers is one of only 29 players in baseball history to date who have appeared in Major League games in four decades. He was also an active players' union member, and was elected vice president of the Brotherhood of Professional Base Ball Players. Brouthers was elected to the Baseball Hall of Fame in 1945 by the Veterans Committee. Born in Sylvan Lake, New York, he played organized baseball from the time that he was a child, from playing in the local sandlots to the semi-professional Actives of Wappingers Falls, New York. On July 7, 1877, while running the bases, he collided at home plate with a catcher, named Johnny Quigley, of the Clippers of Harlem. Quigley was knocked unconscious, having suffered a traumatic head injury, and later died from these injuries on August 12. The 19-year-old Brouthers was cleared of any wrongdoing by the authorities. Brouthers made his Major League debut on June 23, 1879, for the Troy Trojans, and contributed a single in a come-from-behind victory against the Syracuse Stars. Although he was a first baseman, he was called upon to pitch that season with the Trojans in three games, one of which was on August 21 against Tommy Bond and the Boston Red Caps. Brouthers lost 16–0, and within two weeks he was released from the club. He hit .274 that first season, with four home runs, and had 17 RBIs in 39 games played. After his release, Brouthers played for a minor league team in Rochester, New York, and on one occasion in 1880, he hit a game-winning home run in an exhibition game versus the Buffalo Bisons, off future Hall of Fame pitcher Pud Galvin. He hit well enough in the minors to get another shot with the Trojans, which lasted just three games when he had only two hits in 12 at bats, and he was released again. He got his first chance to be an everyday player in 1881, when he was signed by the Bisons, the team that he did well against the previous year. That season he batted .319, and played with them until the team folded after the 1885 season. In his first season with the Bisons, he led the National League (NL) in home runs and slugging percentage. Brouthers, along with teammates Jack Rowe, Hardy Richardson and Deacon White, became known as the "Big Four". In 1882 and 1883 he won his first two batting titles, posting .368 and .374 averages, respectively. Along with his two batting titles, during his time in Buffalo he also led the NL in slugging five times, hits and total bases twice each, and triples and RBIs once each, with his 1883 total of 97 RBIs setting a new Major League record; Cap Anson had set the previous mark of 83 the year before, and retook the record the following year with a total of 102. On July 19, 1883, Brouthers went 6-for-6 with two doubles in a 25–5 defeat of the Philadelphia Quakers. At the end of the 1885 season, Buffalo was going through financial trouble and were forced to sell off their players, so "The Big Four" were sold to the Detroit Wolverines of the NL for US$7,000. In 1886, his first season in Detroit, he again led the league in slugging percentage, the sixth year in a row, and led the league in total bases and doubles and claimed his first home run title. He finished within the top 10 in most offensive categories, including a third-place finish in the batting race with a lofty .370 average. On September 10, 1886, Brouthers hit three home runs‚ along with a double and a single, to set the NL record with 15 total bases in one game. This mark tied the Major League record at the time, as Guy Hecker of the Louisville Colonels totaled 15 the previous month in the American Association. The Detroit team was filled with stars from the era, including future Hall of Famers Sam Thompson and Ned Hanlon, as well as second baseman Fred Dunlap, the "Big Four", and the pitching of Lady Baldwin and Charlie Getzien. The team finished with a record of 87 wins and 36 losses, but finished in second place behind the Chicago White Stockings by 2 1⁄2 games. During the off-season, on November 11, 1886, The Executive Council of the Brotherhood of Professional Base Ball Players‚ formed in 1885 as the first organized players' union, met and re-elected John Montgomery Ward as president, and elected Brouthers as vice president. In 1887, with the 1886 roster intact, the Wolverines finished in first place, besting the Quakers by 3 1⁄2 games. Brouthers batted .338, and led the league in runs scored with 153, doubles with 36, and on-base percentage, while again finishing in the top 10 in most offensive categories. The Wolverines, behind the bats of Brouthers, Thompson and Richardson, led the League in batting, runs scored and slugging, and went on to face the St. Louis Browns in a best-of-15 post-season tournament, the "World's Series". The Wolverines sealed a series championship with their eighth victory in 11 games; however, the two teams finished the series anyway, with Detroit winning 10 games to the Browns' five. Brouthers only played in one of those games, getting two hits in three at bats. Following the season, on November 17, 1887, members of the NL officially recognized the Brotherhood and met with a Brotherhood committee that consisted of three players – Ward‚ Hanlon and Brouthers. The 1888 Detroit team did not fare as well, finishing in fifth place with a record of 68–63, which was a full 16 games behind the first-place New York Giants. Brouthers' numbers declined as well, as he did not produce at the same level of his previous seasons. Even with the lower numbers, he still led the league in runs scored with 118, and doubles for the third year in a row. The team's decline is attributed to prolonged injuries sustained by key players, while turmoil that unfolded concerning veteran stars' salary demands, and with falling attendance numbers, the club was forced to fold at the season's end. Brouthers was then purchased by the Boston Beaneaters of the NL on October 16. In 1889, his only season with the Beaneaters, he batted a league-leading .373, along with 105 runs scored and 118 runs batted in; he struck out only six times. The first strikeout occurred on June 11, when he fell victim to Mickey Welch of the Giants. After the season, he – along with many Major League players – jumped to the Players' League, a league established by the Brotherhood which competed against the two other Major Leagues already in existence. Brouthers signed with the Boston Reds, and batted .330 while leading the league in on-base percentage and slugging. The Reds, behind the talents of Brouthers, Harry Stovey, Hardy Richardson, Charles Radbourn and player-manager King Kelly, finished in first place, 6 1⁄2 games ahead of the Brooklyn Ward's Wonders. The Players' League lasted just the one season, and the Reds merged into the American Association, carrying many of the championship team's previous players. Again, the team won the league's championship, finishing 8 1⁄2 games ahead of the St. Louis Browns. Brouthers led the league in batting average (.350), on-base percentage and slugging, while finishing second in triples with 19, sixth in doubles with 26, and third in RBIs with 109. After the American Association folded following the 1891 season, Brouthers was sent to the Brooklyn Grooms of the NL, where he played two seasons. Most of his success came in that first season, when he led the league in batting average, hits, RBIs and total bases. For the 1893 season, he played in only 77 of the team's games, but did well, hitting .337. After the season, Brouthers was traded along with Willie Keeler to the Baltimore Orioles for Billy Shindle and George Treadway. This trade brought in two future Hall of Fame players, which added to the already established Orioles core of players including third baseman John McGraw, catcher Wilbert Robinson, shortstop Hughie Jennings, and center fielder Joe Kelley, all future Hall of Fame members. The Orioles won the league's championship that season, and it was Brouthers' last full season in the majors, as he again produced great numbers, batting .347, finishing seventh in total bases, fifth in RBIs (128), fourth in doubles (39), and fifth in triples (23). During his career, and most notably during his time in Baltimore, he was known to always have his dog, an Irish setter named Kelly, and had him sit in the players' area. It is claimed that the players never minded much, as he was very well-behaved and never left the area to run out on the field or made very much noise. Early in the 1895 season, Baltimore sold Brouthers to the Louisville Colonels for $500, as his skills seemed to have diminished, and he only played in 24 of Louisville's games that season; he came back to hit .309 for them, ending the year with a .300 overall mark. Following the season, Louisville sold him to the Philadelphia Phillies for $500, where he played in 57 games in 1896, batting .344. It was his last season in the majors until he appeared for the 1904 New York Giants, where he was hitless in a two-game stint before retiring. Brouthers is still among the all-time leaders in many offensive categories. His .342 batting average ranks ninth, 205 triples ranks eighth, and his .423 on-base percentage ranks 15th. He is tied with Mike Tiernan for fourth among 19th-century home run hitters with a total of 106, behind Roger Connor (138), Sam Thompson (127) and Stovey (122). Brouthers played minor league baseball for the 1898 Toronto Maple Leafs of the Eastern League, where he won a batting title with a .415 average. Later he played for the Poughkeepsie, New York, team of the Hudson River League, batting a league-leading .373 at age 46. He remained near baseball for many years, working for his former teammate and New York Giants manager John McGraw, who placed him in charge of the Polo Grounds press gate. He was with the Giants for nearly 20 years in this and other capacities. Brouthers died at the age of 74 of a heart attack in East Orange, New Jersey, and is interred at Saint Mary's Cemetery in Wappingers Falls, New York. There is a statue dedicated to him located in Veteran's Park in this small village. In 1945, Brouthers and several other stars of the era prior to 1910 were elected to the Baseball Hall of Fame by the Veterans Committee. In honor of his achievements in Buffalo, he was inducted into the newly formed Buffalo Baseball Hall of Fame in 1985. In 1999, a survey of the Society for American Baseball Research ranked him as the sixth-greatest player of the 19th century. ↑ James, Bill (2003). The New Bill James Historical Baseball Abstract. Simon and Schuster. p. 438. ISBN 0-7432-2722-0. 1 2 3 4 "The Ballplayers: Dan Brouthers". baseballlibrary.com. Retrieved 2008-06-15. 1 2 "The National Baseball Hall of Fame: Dan Brouthers". baseballhalloffame.org. Archived from the original on January 12, 2008. Retrieved 2008-06-19. ↑ "Progressive Leaders & Records for Home Runs". baseball-reference.com. Retrieved 2008-06-19. ↑ Brouthers is credited with differing totals in career hits; at the time, he was credited with 2,349 hits, a figure still recognized by Major League Baseball, but this total includes 71 walks in 1887, when walks were counted as hits. There are slight variations in other seasons as well, but most sources today credit Brouthers with 2,296 hits. 1 2 3 4 "Dan Brouthers Stats". retrosheet.org. Retrieved 2008-06-15. 1 2 3 "Dan Brouthers' obituary". The New York Times, August 3, 1932. Archived from the original on September 29, 2007. Retrieved 2008-06-15. 1 2 3 4 5 6 7 8 9 10 11 12 13 "Dan Brouthers career chronology". baseballlibrary.com. Retrieved 2008-06-15. 1 2 3 4 5 6 7 8 9 10 11 12 13 14 15 16 17 "Dan Brouthers career stats". baseball-reference.com. Retrieved 2008-06-15. ↑ "1886 Detroit Wolverines season stats". baseball-reference.com. Retrieved 2008-06-15. ↑ "1886 National League Standings". baseball-reference.com. Retrieved 2008-06-15. ↑ "1887 Detroit Wolverines season stats". baseball-reference.com. Retrieved 2008-06-15. 1 2 "Detroit Wolverines/1887 World Series". michigan.gov. Archived from the original on March 11, 2008. Retrieved 2008-06-15. ↑ "1887 National League Standings". baseball-reference.com. Retrieved 2008-06-15. ↑ "1887 World Series stats". baseball-reference.com. Retrieved 2008-06-15. ↑ "1888 National League Standings". baseball-reference.com. Retrieved 2008-06-15. ↑ "A Structure To Last Forever":The Players' League And The Brotherhood War of 1890". by Ethan M. Lewis. Retrieved 2008-06-15. ↑ "1890 Boston Reds season stats". baseball-reference.com. Retrieved 2008-06-15. ↑ "1890 Players' League Standings". baseball-reference.com. Retrieved 2008-06-15. ↑ "1891 Boston Reds season stats". baseball-reference.com. Retrieved 2008-06-15. ↑ "1891 American Association Standings". baseball-reference.com. Retrieved 2008-06-15. ↑ "1894 Baltimore Orioles season stats". baseball-reference.com. Retrieved 2008-06-15. ↑ James, Bill (2003). The New Bill James Historical Baseball Abstract. Simon and Schuster. pp. 438–39. ISBN 0-7432-2722-0. ↑ "19th Century Baseball History". geocities.com. Archived from the original on 2009-10-20. Retrieved 2008-06-15. ↑ "Dennis Joseph "Big Dan" Brouthers". www.findagrave.com. Retrieved 2008-06-15. ↑ "Dan Brouthers' Monument". www.ballparkreviews.com. Retrieved 2008-06-15. ↑ "Buffalo Baseball Hall of Fame". Retrieved 29 August 2012. ↑ "SABR Century Survey Results". The SABR Bulletin. Cleveland: Society for American Baseball Research. 29 (7): 8–9. July–August 1999.